So this week I’ve been mostly snowed under with preparations for the imminent Kickstarter for my far future transhuman science-fiction roleplaying game MINDJAMMER (we’re running a pre-Kickstarter survey at the moment here if you’d like to tell us what you’d like to see published!). Nevertheless the mental wheels building the Ximuria setting for Deluxe Tunnels & Trolls have been whirring away, and I’ve been scribbling notes madly, pinning down huge swathes, and I even have a new map for you! My world-building is now settling down into three “tracks”. 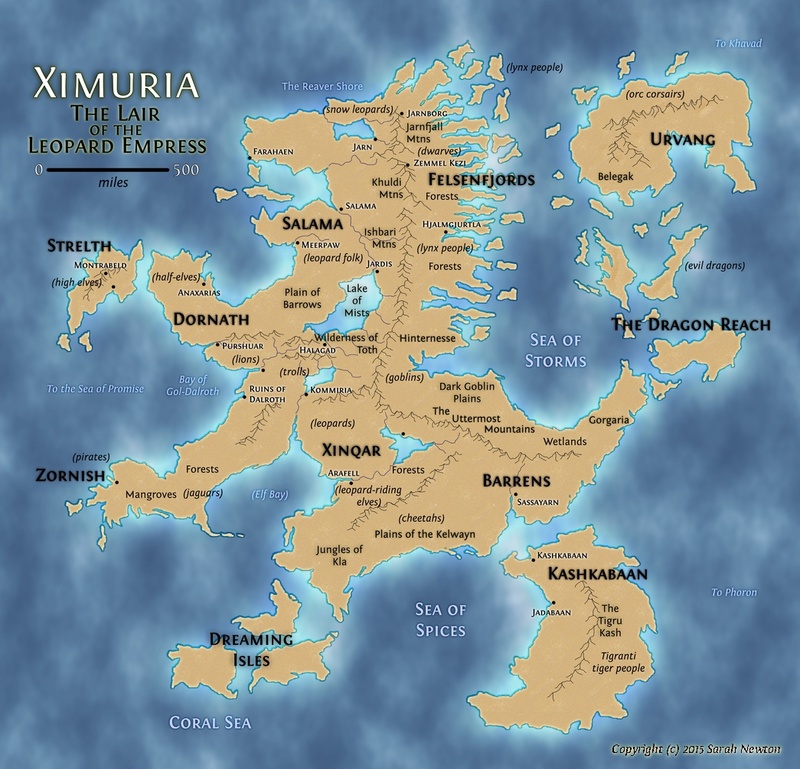 First, the high-level mapping and description of the whole of Ximuria, its lands, peoples, histories, myths, legends, monsters, and so on – typified by the Ximuria map I posted last week and the introduction to Ximuria the week before. Second, the close-focus work on Blackfear Dungeon, the adventure I’m hoping to start running very soon, based on the very first RPG adventure I ever wrote *cough* some years ago; you saw maps of level one and the immediate wilderness area last week. And, third, a “middle-layer” of the Wilderness of Toth, a campaign area about 300 miles (maybe 400) east-west and about 200-250 miles north-south, focussing on the area which until about 50 years ago was the Claw of Bayaal the Black, part of Salama, the Empire of the Leopard Empresses, and is now an increasingly wild region centered on Halagad, the City of Mists. Most of my world-building work at the moment is on tracks one and two – Ximuria and Blackfear Dungeon. I’m also slowly drawing a proper campaign map for the Wilderness of Toth. I think this is pretty typical of how I world-build: the Ximuria creation is revealing huge realities about the world which I need to understand how the “Ebonclaw” (the epithet of the old Salaman claw of Bayaal the Black) became the Wilderness; and the delving into Blackfear Dungeon is revealing the deep history which led to the dungeon and Angistoth Castle above being the way they are. It’s a very effective two-prong attack, which keeps flinging off little gems about the Wilderness too. Mont Dol. A bit trollish. So, first – welcome to Trollbridge! I visited a village called Mont Dol here in France a couple of weeks ago (about an hour from where I live), and immediately got inspired – what a cool base for adventuring! There are all kinds of legends about Mont Dol – there’s a cave there said to be where Merlin lived, the forests of the surrounding flatlands are said to be ancient Broceliande, and there are some weird stones on top, one with a clear “devil’s footprint”. There’s a nice bar, too, of course. Trollbridge nestles at the foot of Trolltop, a huge rocky outcrop similar to a number of other outcrops here in the foothills of the Gebni’s Anvil range. The village is quite young – it was founded after Angistoth castle (and its village) was destroyed by a terrible demon which erupted from the tunnels beneath fifty years ago, on Blackfear Night. The survivors fled to the Fanginshield Inn and the few houses around it, and set about building new homes. They’ve been here ever since–the “old timers” who remember Blackfear Night, their descendants, newcomers, and of course the steady footfall of delvers and adventurers who come for the promise of glory and riches in the ruins three miles to the north (see last week’s rough map for that). There’s a lot to do in Trollbridge, especially of late. There’s no longer a troll beneath the bridge (the adventurer who founded the Fanginshield two hundred years ago cleared it out, giving the inn its name), but a swamp troll has recently moved into the marshlands south of the village and people are worried it’s eyeing the bridge again. There are rumours of ghostly goings-on in the cemetery; and of late there’s been a terrible howling on Trolltop in the dead of night, and people have gone missing. Survivors tell of a deathly hound with eyes of flame. A couple of weeks ago the three main defenders of the village left to investigate rumours of goblins up to no good at Angistoth ruins, disturbing things that should be best left undisturbed; they haven’t been seen since. In desperation, the villagers hired a group of mercenaries to protect them, but they’ve been lording it up at the Fanginshield, draining its beer cellar, annoying the rock demon brewer, and generally letting the village go hang. They’re little better than bandits. And of course lots more. It’s a base of operations for PCs, and a springboard to adventure – whether in the village itself, in the Giantwitch Woods just to the north, or up on Mount Angistoth in the ruins of the castle and in Blackfear’s dungeon beneath them. Trollbridge connected me back to my Ximuria world-building, too, this week, and I found out a lot more about those leopard-riding elves, the Xinqari. The Treekeep in Trollbridge is an ancient Xinqari–I’m not sure if she rides a leopard, but I know a leopard spirit is guarding her house in the woods outside the village walls while she’s on expedition to Blackfear with Halgarian the Hero and Morthyn the Apothecary. I think she also does a bit of officiating at the village shrine sometimes, too–there’s a leopard cult votary statuette there. It appears that the Xinqari are the “primal” elves of Ximuria, from whom a whole lot of other elves are descended. It explains their savagery, their rawness, their apparent lack of the niceties of civilisation–and also their power. They were in Ximuria at the time of the Serpent Kings, way before the Wizards’ War. They kept themselves to themselves, not wanting anything to do with those cthonic antediluvian powers, except for a group of dissenters who crossed the Uttermost Mountains to submit themselves to the Serpent Kings and learn from them. Those dissenters grew mighty, and played a part in the Wizard War, and suffered when the Serpent Kings fell. Those most warped by their terrible sorceries became the Uruk, the orcs of Ximuria, and still remain strong in Urvang today. Some dissenters repented, and tried to return to Xinqar, but were turned away and banished as traitors. Their descendants dwell in the Uttermost Mountains today, the exiled and mournful Night Elves, also known as the Kirendri or “People of the Owl”. And, lastly, a third group of the Elven dissenters fled the destruction of the Wizards’ War yet refused to repent; they dove deep beneath Hinternesse and the Ishbari Mountains, becoming the Nagraefi “Unpenitent”; they’re the people of the bat, and have a taste for blood. Subterranean Vampire Elves, with a penchant for conspiracy and shadows. There are other elves, too. The Strelthi are “high elves”, Xinqari who were once Dwarf-friends, and who broke from the Xinqari after the Elf-Dwarf Wars. They once inhabited all the lands of modern-day Salama, Dornath, and Strelth. They probably got their architectural prowess from the Dwarves (they build marvellous cities), and maybe some other powers too. They’re regarded as the most civilised of the elves, mostly because they don’t actually eat people. The “Havelva” half-elves of Dornath are the descendants of Strelthi and the humans who gradually overran the ancestral Strelthi lands. Lastly, the Second Claw of Salama, the Claw of Jardis the Green, is home to a significant population of elves–it’s sometimes called Elvenclaw as a result. I’m not sure yet who those elves are (they could be proto-Strelthi who managed to hold on when the human tribes arrived), but looking at the trade routes I wouldn’t mind betting they have close ties to the Xinqari and may be a significant force in the Empire, and often a thorn in the side of El-Esmadiel, the Leopard Empress. That’s it for today! More mapping and world-building to come next time!